Google’s cloud-based services are rebranding Google Cloud, the Silicon Valley technology giant announced Thursday. Google has combined its cloud services under the Google Cloud umbrella, including the company’s Google Apps for Work suite, machine-learning tools, APIs and Google’s product collection of Android devices and Chromebooks. 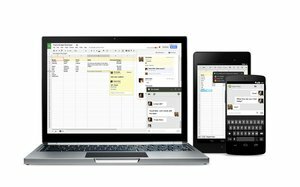 Google has also renamed its Google Apps for Work product -- a suite of cloud collaboration and productivity tools -- as the G Suite. Gmail, Google Docs, Drive, Sheets, Calendar and Hangouts will all now fall under the G Suite moniker. In combination with the Google Cloud rebranding, Google also introduced new cloud technologies and machine-learning intelligence solutions to its G Suite on Thursday. The announcement comes a year after the company first introduced artificial intelligence to its Inbox email application with Smart Reply, which the company now says is used in 10% of mobile replies. Product feature updates include smarter storage and scheduling and presentation capabilities, as well as Natural Language processing on Google Sheets that lets users create detailed spreadsheets without the need to know any formulas.